Yachts are almost exclusively used for recreational purposes and are often associated with affluence due to the luxury and exclusivity they afford. There are two main types of yachts. One is the sailing yacht and the other is the motor or power yacht. They vary in size and dimensions, approximately 40 feet in length on the shorter side, a few hundred feet on the longer side. 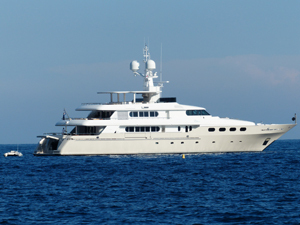 Superyachts typically start at 70-80 feet in length and megayachts at over 150 feet. The modern day yacht can trace its origins to the Dutch navy when it was used as a main vessel to apprehend sea faring pirates – in the 1600s. It became the preferred choice for leisure traveling after Charles II starting using a yacht to travel in luxury. Today’s yachts are extremely customizable, powerful vessels, outfitted with high-end luxury to complement the lifestyle of their affluent owners. They come fully equipped with modern amenities and recreational facilities, sometimes with fully functioning swimming pools, Jacuzzis, gymnasiums, PWC bays, etc. The interiors can be finished in a variety of materials like wood, steel, plywood and veneer based on the owner’s preference. There are two main types of yachts in use today. Sailing yachts range from 20 feet to nearly 100 feet in length. They are also sometimes used for racing. Cruising yachts are very popular among the affluent. They tend to be state-of-the-art and one can find all the modern amenities in them, if not more. Chartering of yachts has gained immense popularity in recent years as people look for unique ways to celebrate special occasions and plan excursions.